Step 1: Know which wax to get. Warning: There are several types of wax out there: liquid wax, foam wax, and hard wax. Liquid and foam waxes are great for touch-ups and maintenance waxing. 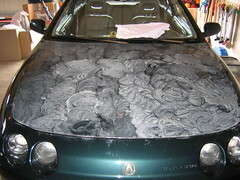 Hard waxes or paste waxes are the ones you use when you do major car-waxing that you need to do at least once a year. Also, if your car has a clear coat finish, make sure that the wax that you’ll get is made for clear coats. Step 2: Thoroughly wash and dry your car first. Warning: It’s basic knowledge that you need to wash your car before waxing it. In the process of maintaining your car’s finish, waxing and buffing is the last step. If you wax without cleaning, the dirt can easily scratch the surface of your vehicle, doing more harm than good. Step 3: Wax in the shade. Warning: Waxing under the sun can make the wax dry quickly, thus, harder to get off. That can make taking the wax off and buffing a lot harder to do. Unless you consider waxing as an overall body workout, better work under the shade. Step 4: Apply the wax with a soft cloth, preferably microfiber. Warning: Soft fibers make sure that you get an even finish and that the paint is not scratched. Microfiber is recommended because it has a soft texture; its fibers leave a streak-free finish. Warning: Following the contours of the vehicle gives off a sleeker and smoother finish compared to waxing and polishing in circles. Warning: This not only makes it easier, but it also allows you to focus on waxing and polishing one specific area for a more even shine and polish. Aside from making your car look great, waxing also adds another layer of protection for the paint’s finish. Wax keeps out dirt and protects the paint from minor abrasions and scratches. It also protects the paint from moisture, keeping rust and corrosion from ruining your car’s exteriors. Though viewed by many as tiring and unnecessary, waxing a car is one way to make its paint job last longer or restore its natural color. It also has a lot more benefits which clearly outweighs the hard work needed. The first thing you would notice after washing your car would be its shinier and glossier appearance, that is because waxing removes the dirt and debris, and not only does it clean, it also repels, making your car shinier for longer periods of time. Waxing also coats your car’s paint, making it resistant to the harmful ultraviolet rays of the sun and would prevent Water Drops from forming later on. Ask your friends and family about any recommendation for waxing your car. Usually, they give the most helpful tips since they experience it first-hand. Do not hesitate to ask your boss or your colleague where he get his car waxed. Check online prices as well. Compare it to the products you can buy locally. It is the perfect investment you can give on your car. You do this only once a year so be careful of the quality or you will end up spending money, time and effort on nothing.